As a close friend and cultural partner, the Institut français d’Ecosse is proud to support the Edinburgh International Harp Festival during its Opening Gathering. We give particular thanks this year to the festival organisers, who acted as consulatants on our first edition of Harpsichord en fête and who arranged for a short harp concert at our festival’s opening reception. As we have done in previous years, the Institut is providing in-kind support for the wine reception that accompanies this opening event. Join for an opening reception and musical gathering featuring cameo performances from some of the artists and tutors participating in the 38th Edinburgh International Harp Festival. Come and meet friends old and new. Beyond the Opening Gathering, the EIHF will run from April 5th to the 10th and will feature more than 10 concerts, 40 courses, and 20 workshops. You can find full programme details here and book online here. Now in its 38th year, the Edinburgh International Harp Festival is an annual celebration and gathering of musical talents. 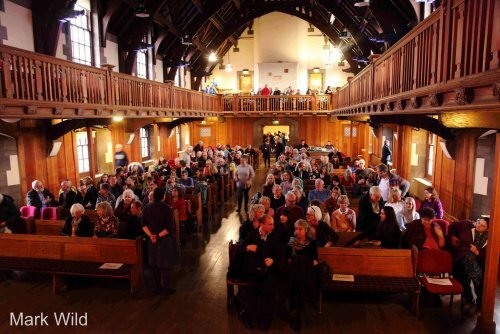 Presented by the Clarsach Society and organised by a skilled and passionate festival team, this 5-day event brings harp players together from across the globe and highlights the prominent place that Scotland holds in the harp-playing world. Established in 1931 at the close of the National Mòd in Dingwall, the Society’s main aim is to promote the clarsach and its music in Scotland and in the wider world harp community. This is done through regional Branches throughout UK and one special interest Wire Branch by organising events, courses and classes to suit the particular needs and enthusiasm of Branch members in each area. As Merchiston is an old school, it is not fully adapted at this time. Since the EIHF wants to be as inclusive as possible, please call the box office (+44 (0)131 554 0212) when booking to discuss your accessibility requirements. The Festival will take whatever steps it can to ensure your enjoyment of the Festival. You may also visit the EIHF’s Venue Information & Access page for more information on accessibility.